A few weeks ago at the VW Festival at Harewood we spotted these small awnings on some VW Splitties so we asked the owners about them. They pop up and they take only 5 Mins. to erect. My wife managed this yesterday on her own so the claims are true. You don't actually attach them to the van but there's no need as the lip of the tent forms a roof between it and the van. They are also modular and you can join them to others and add bedrooms- See Decathlons website for more info where there is a video on how to erect them. These look really good Stevo, quite a modern funky look and I like the idea of just poping them up in 5 mins!! How compact are they when taken down? do they come with any kind of holdall or storage bag? They fold down into a flat circular disc shape and fit into a bag of the same shape so don't take up much room. As for not covering the door you'd be very unlucky if you got wet whilst stepping from the van into the awning. We could always fold out the Fiamma awning a couple of feet to make sure though. BTW Debbie got back from Skeggy just as I set off for work and told me that from getting up, putting the bed away, tidying up AND putting the awning away and ready for off was 15 MINUTES !!! Sounds good... does it have a ground cover sheet included? Agree, 15 mins is pretty good to pack everything away & go! I knew they'd been cheap cos I followed up a thread on the T4 Forum. A lot of folks have sold them on for a lot of profit. How you liking yours Ade ? 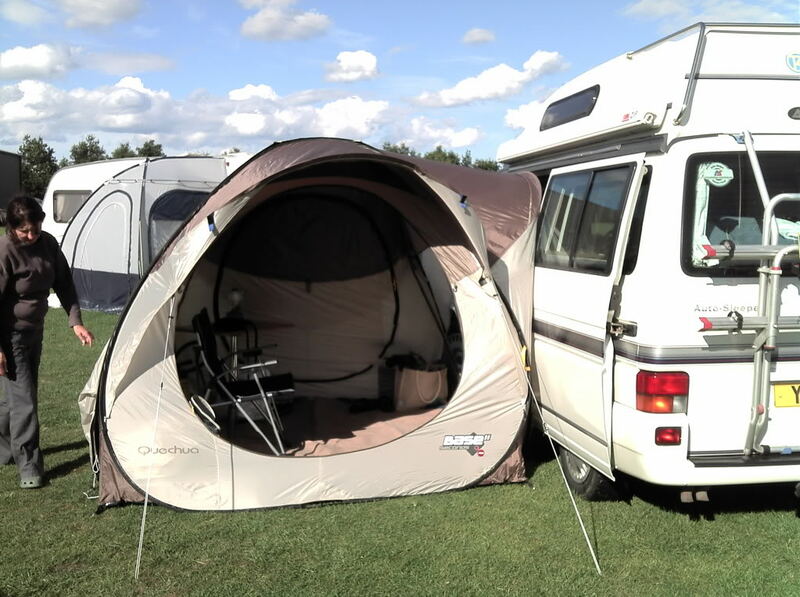 its great takes mins to put up ,it even survived the mad wind at shell island ,and even on my own less than 5 mins to pack away hope to see you at a vw show one day , are you doin vanfest ? No we're not doing Vanvest even though we'll be passing close to Malvrrn on the way to Tenby to watch Debbs' boss do the Welsh Iron man - I know.......he's nuts! Would be great to meet up at a show.......really enjoyed Harewood and was surprised what a family atmosphere it was. Just ordered one at regular price (no change there then) and will test it out over the next six months as our "second home" attached to Petal; so here's hoping we have been well advised!! We've just been touring Wales and stayed in 5 different sites and put the new awning up in all but one of them. 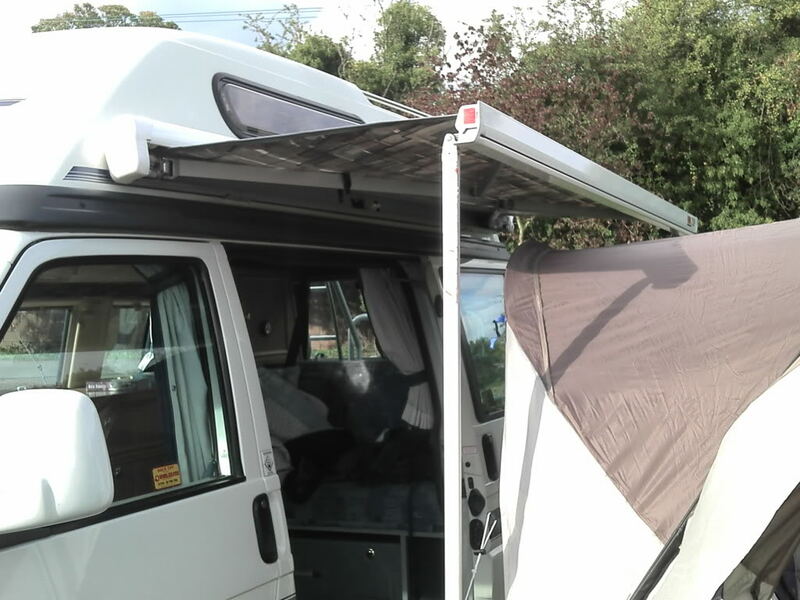 We found that if we over hung the Fiamma awning over it and set it back a couple of feet (as in the pic) then everything kept dry. I also cut a piece of spare cheap carpet (225mm square) and put it on top of the groundsheet and that made everything cosy. They look great. IT've followed the link, product there but no video. Any other suggestions please Steve? Is it really as they say because I don't really have much strength and I'm only 5ft 1"! Thanks s for any info. Steve left the forum some time ago, hopefully one of the other members maybe able to answer your questions.